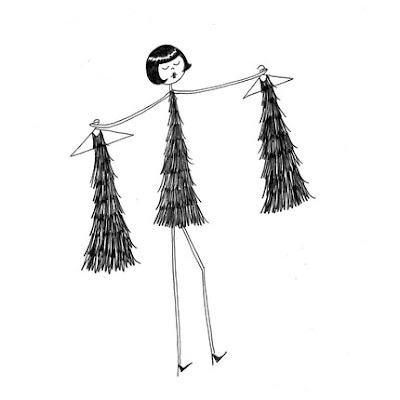 If you've been following this blog for any amount of time, then I'm sure you're aware that my love for the Flapperdoodle ladies is alive and well. Our last giveaway was such a success, that Kate immediately signed up for a special Holiday giveaway that I'm sure you're doing to love. Just to top off Kate's amazing generosity, she's also offering 25% off your full purchase if you use the code "downandoutchic"! 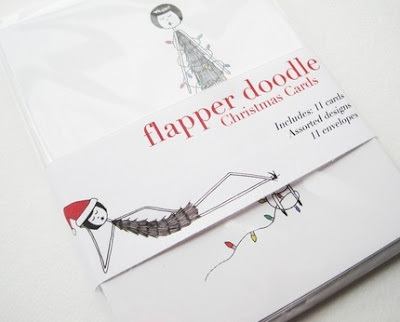 Who wouldn't love a Flapperdoodle print for the Holidays? Winner will be picked 12/8/09 in the p.m. Good luck! Just a reminder that my shop will be closed this Saturday as I'm attending my very first craft fair tomorrow! If you're in Athens, please come see me at the 283 bar's Holiday Market from 11am to 5pm. Shop will reopen, hopefully, sometime on Sunday. i love everything -- but the christmas cards in particular. oh, and main street by sinclair lewis! Such darlings! Look at those facial expressions...too cuuute!! I bragged about it on my blog. I like the Eloise as Marilyn Monroe.. in the pink dress. decisions, decisions is the cutest! Love! Those designs are beyond precious. I love the Eloise as Audrey Hepburn in Sabrina mini print. i just bought an 8x10 and a mini print set last night! shoot. my favorites are ramona wears her new cloche hat & eloise and ramona dance the charleston. and i tweeted about it! i'm a follower! XD thanks for having this giveaway! what a killer giveaway!!!! i love the icecream one and the see saw one!!! actually i love them ALL!!! I follow D&OC and subscribe to the RSS. Eloise as Audrey Hepburn in Sabrina is awesome! I'm also a follower now! One last thing... Adding Down and Out to my blogroll over at SYL! haha need the christmas ones!!! My facebook status: dedicated to you! I love the "Eloise and Ramona prepare for a night on the town." print because it was one of the first few I discovered earlier this year. I also love, love "Ramona wears her new cloche hat." I am a follower!! Love your blog and those antique earrings in your shop!! I love the print Eloise signs "I love you", my sister is deaf so that touches ny heart. I think I might have to get that for her for Christmas!!! I like the decisions, decisions you have posted above. YAY! I'm a follower! Headed to the shop, so I can win!! My favorite-Flapper doodle gocco printed moleskine notebook - unlined!! Divine! 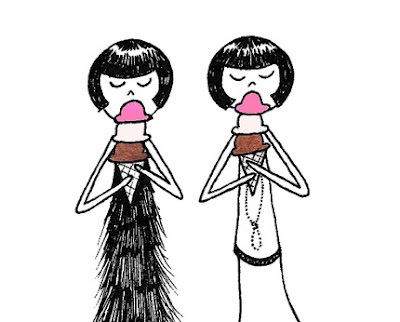 i love so many of the flapperdoodles that it is hard for me to pick, but i really love the one where they are eating cotton candy! naturally i'm drawn to anything that has cats and Emma and her cats is no exception! Eloise and Ramona prepare for a night on the town - mini art print - that's my fave but it's almost impossible to choose - I want them all!!! I love Ramona wears her new cloche hat print! Simply darling! This is one of my favorite blogs, so of course I'm a follower! these are just too cute! and so are the "Eloise and Ramona play telephone" prints. I love the Flapper Doodle Birthday Card Set. No. Scratch that! I LOVE IT ALL!! OH!!! darling what a blast, blast, blast!!! I remember when you had the first giveaway (how exciting a second chance?)! It's so awesome of you and Kate to have another one...Maybe this time I will be very lucky...fingers crossed. p.s. happy Friday to you!!! this is my fave print from flapperdoodle! I tweeted this link as loudly as I could! oh, I hope I win, you don't know how badly I need a lift these days. Ramona the Red Nosed Flapper is very sweet! I love the Eloise and Ramona go shopping and poor Ernest is left holding all of their packages mini art print! Its really cute! Such fun cards! Very Roaring 20s. these are so cute! i love decisions, decisions. lol. 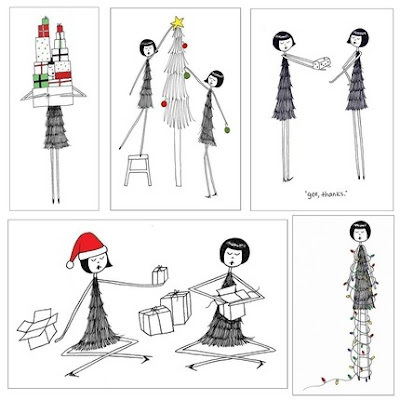 I love kate's new flapper christmas cards!!! and of course I love the 2010 calendar!!! LOVE the decisions decisions one and the self portrait. So hard to pick just one! I love the "Eloise, Ramona and Clarissa dance the Charleston" print! So fun! Oh, they are all fabulous, but I think I like the Audrey Hepburn ones the best! I love the holiday cards, they would be perfect for me this year! I am a follower of Down & Out Chic's blog and twitter! Eloise and Ramona play telephone - 8 x 8 art print set. Thank you so much for having another giveaway with Kate! I totally adore her flappers. I'm drawn to the 'Decisions Decisions' -who can't relate to that one? I am posting a link to your blog on my sidebar!! I would love to win this one!!!! I am loving her journal (this is new from the last time you featured her...) and those birthday cards. She has such fun, and amazing pieces. So generous to do another giveaway! Posting this on my sidebar. I follow. Have been for awhile. Too nervous to comment to you! AHHHH! You are too awesome for little ole me. What a lovely giveaway. If I don't win, I will head over and buy something anyway! and i follow you now!! OMG!! i fell for the designs of those cards :) they're awesome!! 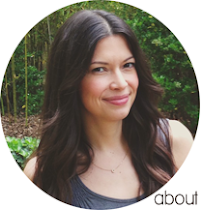 i posted a link to your blog on my sidebar too!! I'm a follower now, looking forward to reading your blog! I love the flapper flash cards! And the anniversary cards. I love everything, I already own the birthday cards! I bought the Christmas cards to send to friends this year and was a little disappointed that I didn't have some left for myself. They are so beautiful. I really like "Emma re-reads Main Street by Sinclair Lewis," "Emma is fascinated with The Great Gatsby," "Eloise Ramona and Clarissa have a party," and "Eloise and Ramona drinking lemonade." There are too many to choose from! 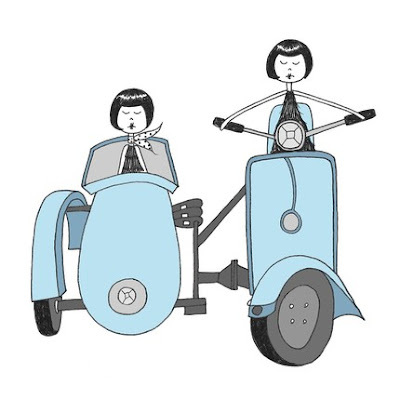 I love the two women riding the Vespa, and Zelda and Becky getting ready for a night out. Thanks for the giveaway! Hey girl I'm a new follower. Hi!! I love Flapperdoodle! I love all of the ones with Eloise, Ramona and Clarissa...it reminds me of my mom and sister and I! Christina, these are awesome! My favourite is "Emma and her cats" - so cute! oh - and I'm a follower! I am a new follower...enjoying your blog! And I just adore the mommy and me art print! That is so so cute.